"Since his death in 1942, St Ives has become marinated in the spirit of the na ve painter, Alfred Wallis. Naum Gabo, the Russian Constructivist, felt that Wallis's gift as an artist was that he never knew he was one. His unconventional approach and the innocence of his personal method of making art marked Alfred Wallis, even after his death, as a crucial figure in the modernist movement. The art scene in St Ives during World War II is depicted vividly in The Alfred Wallis Factor which illustrates the birth of modernism in the small fishing port in the far south-west of England. With dominant personalities like Sven Berlin, Ben Nicholson, Barbara Hepworth, Adrian Stokes, Bernard Leach, Terry Frost, Peter Lanyon, Wilhelmina Barns-Graham and Patrick Heron, it was inevitable that personal relationships would both form and fracture. 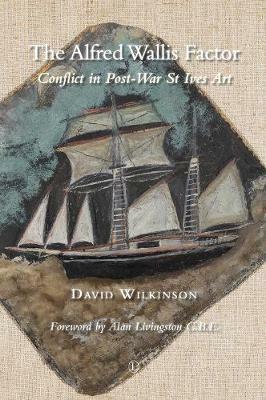 Though causes would range from the banal to the bizarre, David Wilkinson never loses focus on the high stakes for which these characters were playing: the creation of their work, and reputations, of lasting significance. Their passion was strong and their ambition even stronger. The Alfred Wallis Factor tells the story of this extraordinary painter's long-lasting influence on - and beyond - modernism: David Wilkinson expounds the events around and following the artist's death, assessing the roles of friends and rivals in making Alfred Wallis a benchmark of modern British art. The Alfred Wallis Factor is a comprehensive examination of a troubled era, in which life met war and changed the destiny of the art world."